A lot of voices of the frog might be asked at the breeding time of the Japan hyla, and it become a large chorus in the group according to the place. The cry at this time is used so that the male may inform the surgical knife of its existence. 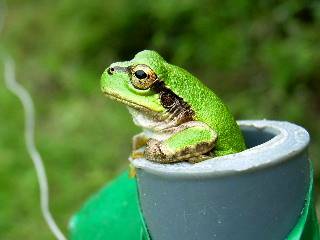 A big feature when the Japan hyla seems to rain as shown in the name of "Tree frog" is to bark in daytime other than the breeding time. The surgical knife of the length is larger than that of the male. A brown, fat belt goes from the nose to eyes and ears. The forefoot is four, and the number of the fingers is by the hind leg and has five there is a sucker on the finger. The belly is usually white in the color of the body, and the back is a pea green. The back might be changed into a blackish color, ash brown, flesh-colored spotted pattern as a protective coloration. The Japan hyla often lives on the tree, and lives in on the plant in the waterside and the forest, etc. though often lives by the frog in the waterside. It acts outside at warm time, and it hibernates in the earth where the temperature change is a little at cold time of winter. The eaten one preys on a small insect and the arachno, etc. in meat and poultry. Because the moving one is caught, it eats neither the dying animal nor the one that doesn't move. Chytrid fungus syndrome infected of amphibians is very strong the infectivity, high the case fatality rate, too and sick. The number of frogs will decrease in the future and the ecosystem might be changed. It was calm in the pipe of VP13 in the electrified fence for the wild boar. It tried to remove the electric wire and the pipe, and it did not know and it greatly liked this pipe or there was a person who did not try to run away at all, too. The color of the body is matched to a surrounding thing and the hyla is changed. There is a sucker in digitus pedis. Let's be washed one's hands well later when touching by bare-handed because there is a poison fang in outside of the body. Do not abandon the corpse in the outdoors when the frog that keeps it dies though the chytrid fungus syndrome gets into the news. Moreover, please do not throw away the kept water to the outside. Please consult the core veterinarian if it worries in the chytrid fungus syndrome.